The holiday season brings many a party and lots of joy. But anxiety can also creep in with finals, travel, buying gifts that burn a hole in the pocket and the much talked about and oh so special “Family Stress”. 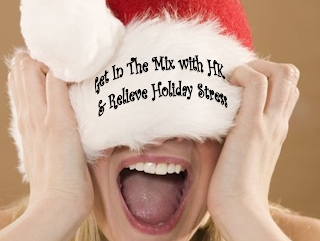 Don't worry though, cause In The Mix with HK™ is gonna kick that holiday stress to the curb. I mean, we are here for YOU! And the experts have our back. Mayo Clinic says, in their “Tips To Tame Stress”, that “listening to music is a good stress reliever because it provides a mental distraction, reduces muscle tension and decreases stress hormones”. They go as far to say “Crank up the volume and let your mind be absorbed by the music”. Oh yeah …I’m gonna be crankin’ up the volume this weekend with an all-out sonic party jam you just can’t miss! Look at what I'm putting under the tree for you. Brand new exclusive HK mixes on Gwen Stefani, Charlie Puth, Flo Rida and Justin Beiber. I'm also filling my Santa sleigh with exclusive never before heard versions of hits from Demi Lovato, DNCE, Adele, and Shawn Mendes! My bounty of musical presents is sure to excite when I unwrap the likes of One Direction, Daya, Tori Kelly , Adam Lambert and more.